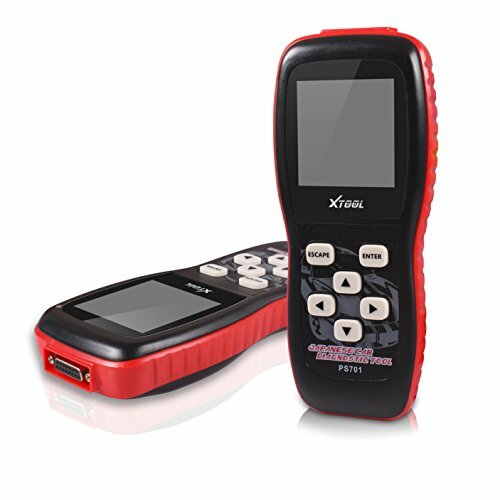 The Xtool PS701 Professional Diagnostic Scan Tool for Japanese vehicles with JOBD and OBDII protocols. Though small in size, it is powerful enough to do the same work as expensive workshop level scanners, while at the same time, fast and handy compare to workshop level scanners. 1.The connector should be located under the dash and legally should have nothing covering it. 2.Look below the steering column, on the lower dash above the clutch pedal, or possibly behind the ash tray. 3.Once you plug the cable into the tool & into the vehicle's connector, the vag scan tool will automatically turn on. 4.The diagnostis tool quickly displays readings for any errors your car may be registering on the dash & allows you to turn off the check engine light (or other errors) if you so choose. Much powerful than a simply car code reader. More applicable Japanese vehicles and support special function: Oil services reset & Airbag Reset & Throttle adaption & Mileage Reset & EEPROM access etc..
Quickly displays readings for any errors your car may be registering on the dash & allows you to turn off the check engine light (or other errors) if you so choose. Engine, Auto Trans, ABS Brakes, Auto HVAC, Cent.Elect, Airbags, Steering Wheel etc.. If you have any questions about this product by XTOOL, contact us by completing and submitting the form below. If you are looking for a specif part number, please include it with your message.